It’s almost after Thanksgiving and I want to say how thankful I am for all the readers of Make it easy crafts. It’s been a great year for crafting. So since the official holiday season will soon be underway, I am offering two easy craft projects today. Thanks to you all for comments and suggestions. This is a great project to do with your kids. Mom or Dad can cut and bend the wire and the kids can weave the bracelet. Since you only use the rubber bands you can purchase in packets and two pencils it couldn’t be any easier! If you choose you can eliminate the wire curl attachment and just use the c-clamps that come with the rubber bands. 3. Add a white rubber band and repeat step #2. Continue adding rubber bands and pulling over the top alternating red and white. You will start to see a chain forming in between the pencils. As it grows, pull on it slightly to keep it even. 4. Keep adding bands and make the chain longer and if you want to use the c-clamps you can just make it as long as you want and do that or make the chain a length to fit adjusting the size for a one inch wire curl. 5. Using the wire cutters cut a 3-inch piece of 16-gauge wire. Rub the cut ends of the wire on a sanding block to smooth. Insert the wire into the loose end of the chain loops. Curl the wire end around the rubber band loop. 6. Remove the other end of the chain from your pencils and insert the uncurled end of the wire in both loose ends. (Sorry for the blurry photo but you get the gist) Curl it around as you did the other side and adjust if necessary. 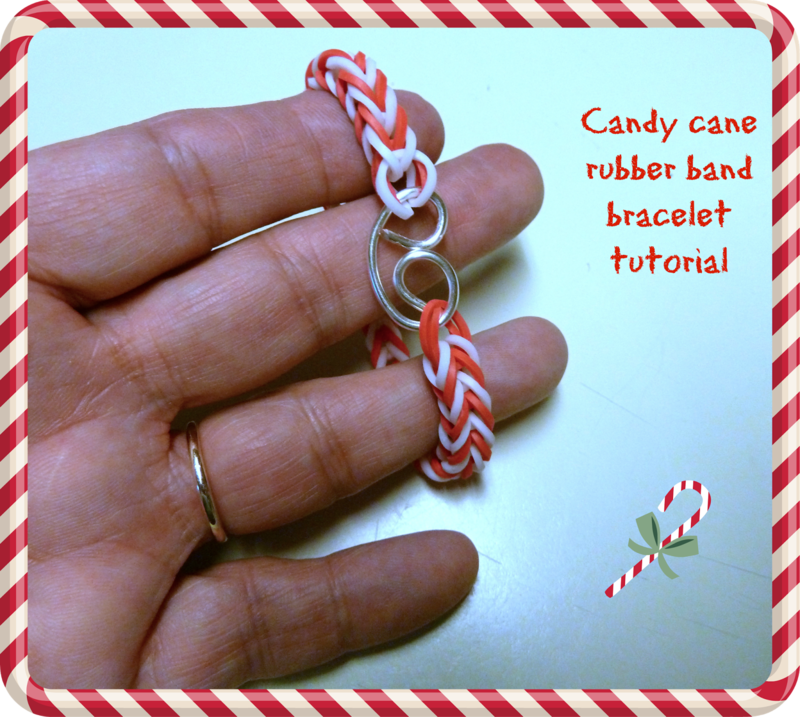 Such a fantastic tutorial for making candy cane rubber band bracelet and I am very happy to learn from here and hope that now I will be able to prepare some beautiful candy cane rubber band bracelet. Thanks mate for giving this tutorial.